2. Place the egg whites into the bowl of a freestanding electric mixer with the whisk attachment (you can also use an electric handwhisk) and whip on high speed until stiff peaks form – about 1-2 minutes. 3. Add the caster sugar 1 tbsp at a time with the mixer on medium until all the sugar is in. Continue to whisk on high for another 2-3 minutes. It should look thick and glossy, holding a firm peak when the whisk is lifted out. sure the meringue is completely joined together. Repeat for the other 5 meringues. 5. Bake in your preheated oven for 1 hour and 20 minutes. When the meringues are ready they should lift away from the paper easily and be hard if tapped. Cool on a wire rack. 6. 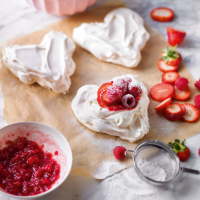 Whip the cream with the vanilla bean paste until it forms soft peaks, then spoon on to the top of the meringue hearts. 7. Take a quarter of the raspberries and place them into a bowl with the icing sugar. Mash with a fork until smooth (you could sieve the coulis, but I prefer it with a bit of texture). 8. Top the mini Pavlovas with the remaining raspberries, sliced strawberries and raspberry coulis. Use the leftover egg yolks from this recipe to make my rhubarb and custard tartlets.